Located at the foot of Daci Hill in the Hangszou, Zhejiang province of China lies the scenic Hupao Spring, also known as the Dreaming of the Tiger Spring. 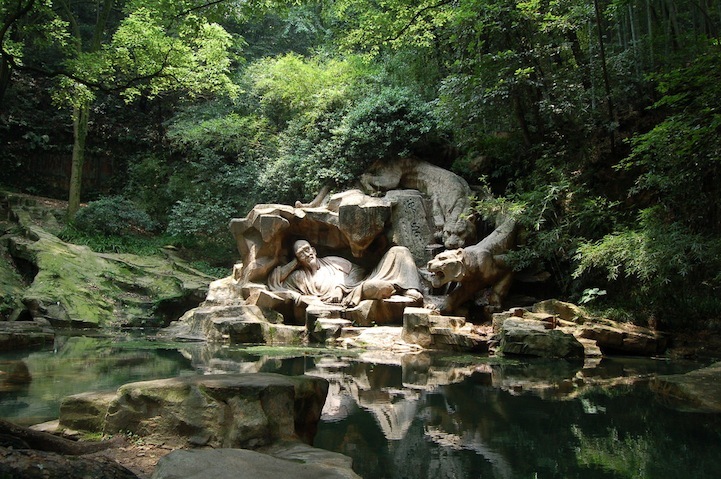 The picturesque landscape features an eye-catching sculpture of a man, seemingly caught in a slumber as two tigers creep their way down the rocks towards him. Despite the imminent danger one may predict for an unguarded man being approached by the wild beasts, the sculpture projects a sense of peace.